Ein is in the town, and I don't have anything for her! I haven't seen her for... 2 years? And we were supposed to meet up for breakfast at 0930. So I woke up at 0700 and decided to make her a ring, by following Mei's Sparkly Crystal Ring Step by Step Pictorial Instructions. 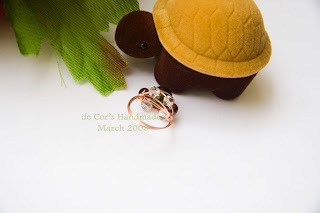 :) Ein's ring is my first attempt to make a ring ever - and I made it in just 10 minutes with help of Mei's tutorial! That's amazing isn't it? It's made of 24gauge wires (I only have 24gauge wires at the moment so I was lucky enough to catch Mei online and she told me using 24ga wires is completely fine - just remember to coil on the mandrel for a few more times, thanks for the instant tips Mei! 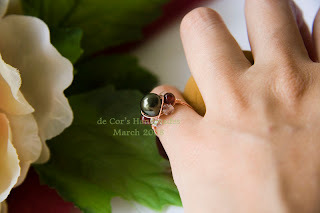 ), a 8mm dark green color's Swarovski Pearl (I called two common friends to find out what is Ein's favorite color, I am sorry that I didn't know Ein enough! 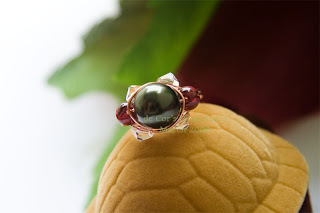 ), 4mm Garnet beads and 4mm Swarovski Crystals. 1) Coil on the mandrel for a few more times means coil on the mandrel BEFORE attaching Swarovski Crystal beads, and be flexible on positioning your wires! Corra, I am impressed. Very well done. Easy ya? Hey Corra,thanks for the tips! I've just bought Mei's tute, so I'll give it a go. Check our inbox(gmail). Ohhhh, I am so excited. Thanks for the interest. thanks Corra. I'm so lucky to have it! what else can i say :D haha.